The strategic illiteracy on display in the arguments put forth on the Rafale deal before the Supreme Court is breathtaking, argues Colonel Anil A Athale (retd). As someone working in the area of national security for the last 30 years, one is aghast at the drama unfolding before the apex court on the Rafale issue. The strategic illiteracy on display in the various arguments put forth, both inside the courtrooms and in the media, is simply breathtaking. This column is an attempt to try and bring some sanity and common sense to bear on the issue. India faces three basic external threats to its national security. One is the strategic nuclear threat, second is the conventional threat and third is the proxy war that is ongoing. To deal with the first, we have a robust nuclear deterrence centred on land-based missiles, nuclear capable aircraft (like the Rafale and Sukhoi-30MKI and nuclear missiles on board the submarine INS Arihant that has just completed its first operational patrol). Since the aim of these strategic forces is to 'deter' by a show of overwhelming force, details about the capability of missiles are regularly put out in the public domain. Everything about the missiles, except where they are located and their electronic countermeasures, is known to the public and our adversaries. Even in case of conventional forces, the overall strength and most of the weapons held is also not a secret. The aim being that our known strength should hopefully deter even an all-out conventional conflict since that can easily escalate into a nuclear exchange and as everyone knows, or ought to know, nuclear wars can never be won and therefore should never be fought. The third and the most challenging threat is the proxy war that India has been facing for over three decades. This is being fought by instigating unrest in the interiors as well as through terrorist attacks. Need we be reminded that we are only days away from observing the 10th anniversary of the Mumbai terror attacks of 26/11? Indian strategy till a few years ago has been essentially passive. We had concentrated on shoring up our defences. But since the last two years there has been a change and India has decided to carry the attack to enemy territory. So far the response has been confined to ground forces, but surgical air strikes are a potent option. The acquisition of Rafale aircraft fits into this strategy. Combined with Special Forces (commandos), air power can play a vital role in punishing the adversary for a 26/11-like misadventure. In short, and in layman's terms, Indian military power can be broadly divided into deterrent forces and 'usable' force. Secrecy about the exact capability of the 'usable' force component is absolutely necessary if we have to succeed in punishing the enemy for 26/11 -like misadventures. Attorney General K K Venugopal hinted at the possible role of the Rafale when he referred to the Kargil conflict of 1999. The Rafale was not around then, yes, but what was intended to convey to the honourable court was that in a future conflict, the Rafale would be of great use. 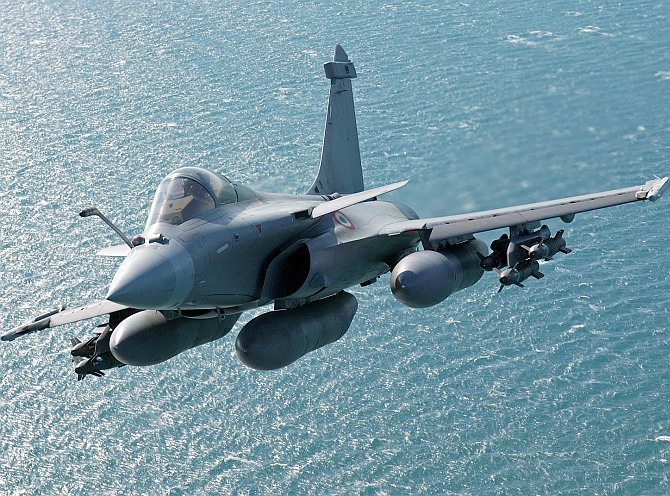 It is in this context that the detailed configuration of weapon systems on the Rafale needs to be a closely guarded secret. Giving out the details of pricing will surely help our adversaries to guess the configuration and take countermeasures. I am not an aviation expert, but I disagree with the argument that national security is being compromised because we are not getting the 126 Rafales as envisaged earlier, but 'only' 36 aircraft. My guess is that given the emphasis on 'Make in India', the Indian Air Force may well have worked out a combination of Rafales and an increased number of Tejas indigenous fighters to make up the perceived shortfall. Also, not to forget the recent agreement to buy the Triumph S-400 defensive missile shield from Russia despite American opposition. Logically, with deep penetrating antiaircraft missiles in our inventory, we could do with fewer fighter aircraft. This is only an educated guess and experts could throw more light on this issue. The Indian Air Force has vast experience in flying different types of aircraft in lethal combination. In the recent air exercises, our combination of Su-30 and old MiGs got the measure of the US air force. PIL addicted lawyers may be aghast, but let me tell them one truth. While India has a declared policy of 'no first use' of nuclear weapons, we are obviously ready to pre-empt our adversary if we receive definite information from our satellites that it is about to launch a nuclear strike on us. In such a situation we will try to catch enemy aircraft and missiles on the ground. It is in such a scenario that advanced manned fighters like the Rafale will play a crucial role. The PILwallahs should actually raise this question as to why we are likely to change our policy of 'no first use' at the last moment and that too without following 'due procedure', the term so loved by this fraternity. To paraphrase the German military thinker Carl von Clausewitz who wrote 200 years ago, woe to a nation that tries to fight a war with rules when the adversary knows no rules other than its own power. Finally, a small piece of advice to the legal fraternity. Now that you have entered the dangerous terrain of security policy making, educate yourself by at least reading these two books -- Arms and Influence and Strategy of Conflict by the doyen among strategic thinkers of the 20th century, Thomas C Schelling of Princeton University.